Le Moyne Community is Going Teal for Sexual Assault Awareness Month Le Moyne community is going Teal today! April 2nd was the day of action for Sexual Assault Awareness and Prevention Month. 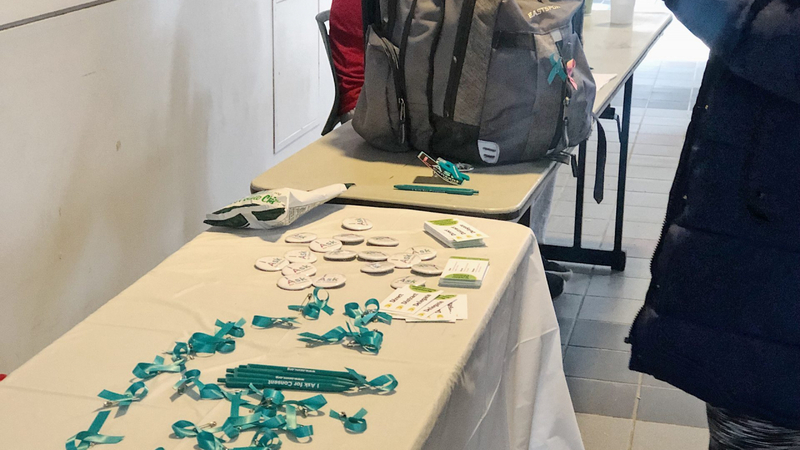 In order to show support for this day, an organization named Dolphins Against Violence holds an event named “Teal Tuesday,” distributing free teal ribbons at Le Moyne College Campus Center. Teal is the color that represents sexual violence prevention. By inviting the whole community to wear teal, the organization hopes people can realize the significance of sexual assault prevention and change the abusive environment around them. Rochelle Robinson is the violence prevention educator of Dolphins Against Violence. She says that it is their first time to hold events on the day of action. They will organize more events that are open to the whole Syracuse community in the future. People can go to the official website of the National Sexual Violence Resource Center (NSVRC) to seek more formation about Sexual Assault Awareness and Prevention Month. Here on the Le Moyne College campus center, an organization named Dolphins Against Violence is distributing free teal ribbons. Teal is the color that represents sexual violence prevention. We can see a lot of students are walking in the campus with a little teal ribbon on their bags. A Le Moyne senior student Noelle Natoli says it is a good way to attract attention. Rochelle Robinson is the violence prevention educator of Dolphins Against Violence Organization. She says today’s event is sponsored by a national non-profit organization. According to Rochelle, in the future, the organization will hold more events that will be open to the whole Syracuse community.